I BELIEVE . . .: Happy Father's Day! 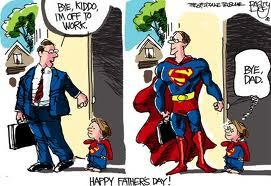 Dad's are known by many titles - there are dad's, step dad's, foster dad's, granddad's. Dad's are hero's, the pillars of the family, known for the love they give and the values they teach. Dad may teach you how to tie your shoes or how to ride a bike, spend countless hours assisting you in perfecting your science project, coach you to excel in sports, quiz you in preparation for your weekly spelling exam or math final, hold the oil pan for your first oil change, or walk his baby girl down the aisle . . . all the while inspiring his kids to dream more, learn more, do more and become more. Dad's are true leaders, finding out who their children really are and inspiring them to become it. Above all else Dad is a child's first hero and role model, which is a very important task. I commend the great Dad's who take this role seriously and are dedicated to the empowerment and enrichment of their children's life's. U ROCK!! Cheers to my Dad, Granddad's, and ALL the Dad's I know - Wishing you a wonderful day filled with magical moments, great laughs, new ties and fragrant soap-on-a-rope. It is hard work to be a hero, but it is in your job description. Parenthood is not for wimps!